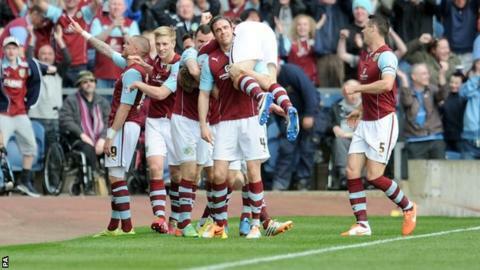 Burnley have been promoted to the Premier League after victory against play-off hopefuls Wigan at Turf Moor. Ashley Barnes converted Dean Marney's cross from close range to give the dominant hosts the lead. Wigan striker Marc Antoine Fortune headed against the bar before Michael Kightly's free kick doubled the advantage. Danny Ings hit the post for Burnley after the break before Latics forward Fortune headed wide. Clarets boss Sean Dyche has only paid a transfer fee for one player since being appointed in October 2012 - buying Ashley Barnes from Brighton for in the region of £400,000 in January. Wigan are left still needing points to secure their top six spot, while Burnley join Leicester in the top flight next season. Burnley, who had lost their last two home games, were promoted to the Premier League via the play-offs in 2009 but the last time they had earned automatic promotion to the top flight was back in 1973. There was no stopping them on Monday as they dominated from the start to race into a 2-0 half-time lead. The Clarets are now just four points behind leaders Leicester, who play their game in hand at Bolton on Tuesday. Few expected Burnley to be challenging for an automatic promotion spot at the start of the season, with a number of their Championship rivals spending big in an attempt to get into the Premier League. Leicester and Burnley, the two teams to have been promoted from the Championship this season, have both used the fewest players with 23. Clarets boss Sean Dyche has only paid a transfer fee for one player since being appointed in October 2012 - buying Ashley Barnes from Brighton for £400,000 in January. And it was Barnes who gave Dyche's men the perfect start, tapping home from close range after Marney's low cross from the left. Wigan have suffered a slump in form in recent weeks, having won just two of their last seven games in all competitions, after manager Uwe Rosler rescued the Latics' season following Owen Coyle's disappointing tenure. They knew a win would all-but secure them a place in the play-offs but, bar a Fortune header against the bar, it was the hosts on top. Their efforts were deservedly rewarded just before the break as, after Scott Arfield was fouled near the bye line, Kightly stepped up to brilliantly curl home Burnley's second. Wigan improved after the break and almost pulled a goal back when Fortune latched on to Jason Shackell's poor header, but his toe-poked effort was blocked by Tom Heaton. Ings nearly added to the scoreline with a right-footed shot against the outside of the post. Burnley manager Sean Dyche: "We were intent on getting promoted ourselves, not having to rely on anyone else for help. "It's getting harder to win automatic promotion to the Premier League because of all the constraints on teams like ourselves. I'm extremely proud." Burnley striker Danny Ings: "I'm so proud of all the lads. From pre-season to now, they have been absolutely fantastic. Sam Vokes has been top class this year, it was a shame he was not out on the pitch today but he deserves it. People did not back us at the start of the season, but it's been great to prove them wrong." Burnley midfielder Michael Kightly: "It's a great feeling. It's been a long season but we thoroughly deserve it. We'll enjoy today, then crack on next year. We never got complacent, we always stuck to the job. The boys have been different class and the fans have been magnificent." Match ends, Burnley 2, Wigan Athletic 0. Second Half ends, Burnley 2, Wigan Athletic 0. Jack Collison (Wigan Athletic) wins a free kick in the defensive half. Corner, Burnley. Conceded by Jean Beausejour. Attempt blocked. Scott Arfield (Burnley) left footed shot from the right side of the box is blocked. Assisted by Chris Baird. Foul by Marc-Antoine Fortuné (Wigan Athletic). Attempt blocked. Callum McManaman (Wigan Athletic) right footed shot from the right side of the box is blocked. Assisted by Jack Collison. Corner, Wigan Athletic. Conceded by Ben Mee. Offside, Wigan Athletic. Robert Kiernan tries a through ball, but Marc-Antoine Fortuné is caught offside. Attempt saved. Ashley Barnes (Burnley) right footed shot from outside the box is saved in the centre of the goal. Callum McManaman (Wigan Athletic) wins a free kick in the defensive half. Substitution, Burnley. Chris Baird replaces Kieran Trippier because of an injury. Substitution, Wigan Athletic. Nicky Maynard replaces James McClean. Attempt missed. Emmerson Boyce (Wigan Athletic) header from the centre of the box misses to the left. Assisted by Jean Beausejour with a cross following a corner. Leon Barnett (Wigan Athletic) wins a free kick in the defensive half. James Perch (Wigan Athletic) wins a free kick in the defensive half. Jason Shackell (Burnley) wins a free kick on the right wing. Attempt saved. David Jones (Burnley) left footed shot from outside the box is saved in the bottom right corner. Jack Collison (Wigan Athletic) is shown the yellow card for a bad foul. Attempt missed. Emmerson Boyce (Wigan Athletic) header from the centre of the box is close, but misses to the left. Assisted by Jean Beausejour with a cross following a corner.